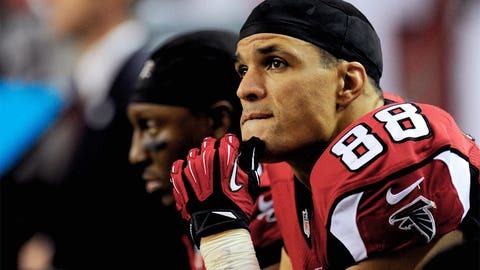 Tony Gonzalez was drafted by the Chiefs and spent his first 12 seasons in Kansas City. KANSAS CITY, Mo. — Even though Tony Gonzalez is retiring as a member of the Atlanta Falcons, the Kansas City Chiefs still view the 13-time Pro Bowl tight end as one of their own. One day after Gonzalez reaffirmed that he’ll never play another NFL game, Chiefs chairman Clark Hunt said in a statement that he’ll "always be considered a part of the Chiefs family." Gonzalez was drafted by the Chiefs and spent his first 12 seasons in Kansas City. He was traded to the Falcons in 2009, when it appeared that Atlanta was going to give him a better shot at playing in the Super Bowl that eluded Gonzalez his entire career. At halftime of his final game Sunday, Gonzalez was presented with a half Chiefs, half Falcons commemorative helmet. Atlanta wound up losing 21-20 to the Carolina Panthers. "On behalf of the entire Chiefs family, I want to congratulate Tony on an incredible career," Hunt said. "What he was able to accomplish during his time in the NFL is truly remarkable, and I have no doubt that Tony is a first-ballot Hall of Famer. We were very blessed to have him in a Chiefs uniform for 12 seasons, and his contributions on and off the field were extraordinary." Gonzalez pondered retirement last season, but after the Falcons came up just 10 yards short in the NFC title game, he put it off to make one more run at the Super Bowl. Instead, an abundance of injuries, poor offensive line play and a defense prone to big plays resulted in a 4-12 finish and a hollow ending to Gonzalez’s brilliant playing career. "Obviously it just wasn’t in my cards, and I’m OK with that, honestly," Gonzalez said. "Don’t ever look at me and say, `Well, he never won the big game.’ I hope there’s no glitch on my record because of that, and if you think that way, I don’t know what you’re talking about. I really don’t because this is the ultimate team sport." The Chiefs made the playoffs on three occasions with Gonzalez, twice losing in the divisional round and once losing a wild-card game. Along with losing the NFC title game last season, Atlanta also came up short in the wild-card round in 2011 and the divisional round in 2010. Those playoff failures aside, Gonzalez still finished his career with NFL records for tight ends of 1,325 receptions, 15,127 yards receiving, 111 touchdowns receiving and 31 100-yard receiving games. He had 916 of those catches for 10,940 yards and 76 TDs in Kansas City. "He’s one of the all-time greats, a future Hall of Famer," said Chiefs coach Andy Reid, who never had Gonzalez on one of his teams yet always admired him from afar. "I’m proud to have known him, and still know him, and I’m hoping he enjoys retirement and does as well there as he does on the football field, which I’m sure he will with that Cal education." Gonzalez said he had no regrets with the way his career ended, and he didn’t sound as if he’ll reconsider stepping onto the field again. Over 40 family members and friends were on hand for his final game at the Georgia Dome on Sunday. "This is like graduating to me," Gonzalez said. "I’m going to miss it. I’m going to miss my classmates — my teammates. I’m going to miss my coaches – my teachers. I’m going to miss them."